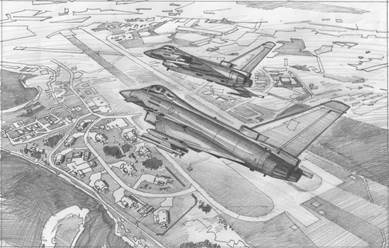 The Making of Wings Over "1"
I have just finished an exciting commission for No.1 (F) Squadron. Flt Lt Bryan McCormack, a member of the squadron contacted me back in February 2014. 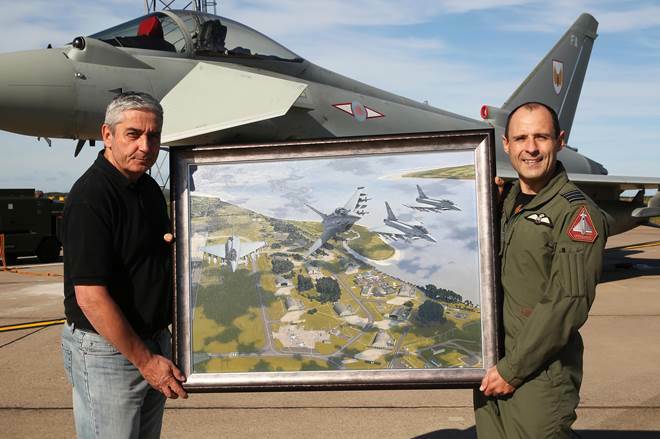 He said they had been looking at some artists for a special painting to commemorate their stay at RAF Leuchers. Senior officers had selected my work, and would I like to accept the commission? Would I? 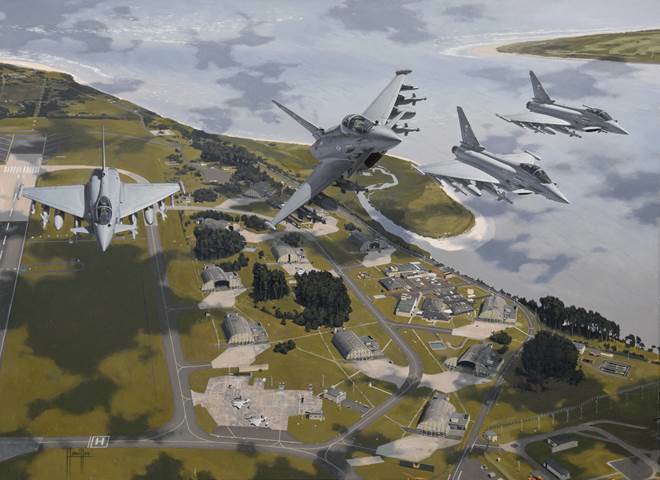 This significant RAF station, which has a rich history, was to be handed over to the Army, and 1 Sqn with their Eurofighter Typhoons was to be moved to RAF Lossiemouth. I was asked to come up with a couple of ideas for the composition. The general brief asked to feature the Hardened Air Shelter (HAS) site, the operational hub of the squadron at Leuchers, and to possibly feature the golf course of St. Andrew's, which is just across the estuary of the River Eden from the airfield. So I had a bit of a think, and got an idea of what reference I had of Typhoons in formation, which would help me. 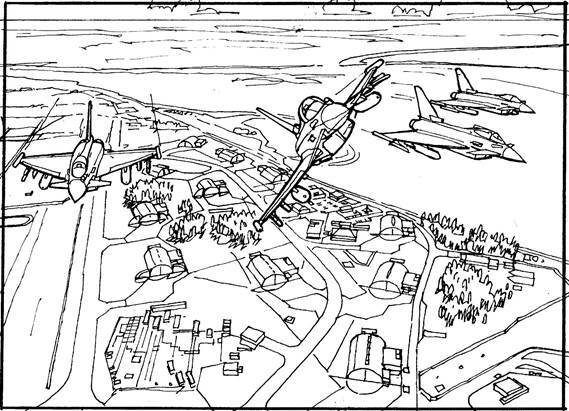 I had also to consider what reference I had of Leuchers from the air, and the 1 Squadron HAS site itself. I found this was my limiting factor, as there were only a couple of existing aerial photos of Leuchers and the squadron site, neither of them really useable. What I decided to do was try to find a good aerial view by using Google earth. By moving the viewpoint over and around the Leuchers satellite map, I eventually found a couple of different and contrasting views that I could build my ideas around. I think it's important to point out at this stage that whatever you present as ideas at this stage, you must have the means to reproduce in the artwork. I used Google earth as a guide to the true layout of the airfield as I had been assured by the squadron that they could get some photography done of the view I needed. I used these two views as my starting points for the two ideas. The first was quite a dynamic, downward viewpoint of the airfield, with a typhoon climbing hard away from it towards the viewer, with the HAS site visible behind. The second was a more sedate, conventional scene, with a pair of typhoons in the foreground, of which I had already found my reference. These two roughs were done in pencil and given some tone to give the client an idea of the finished effect, not just what bits are going where. I emailed the drawings to 1 Squadron, and after a couple of weeks, got their feedback. I was told the CO had an idea in his head of what he wanted, and the best way to proceed would be to have a meeting at Leuchers for a face to face brief. After the arrangements were made, and with great anticipation, I made a trip to the east coast of Scotland. I was met by Flt Lt Bryan McCormack, and taken to meet with the OC, Wg Cdr Mark Flewin and Sqn Ldr Jan De Vry. It was a busy day to visit, as the whole station was due to congregate for a mass photograph later in the day. The OC's new brief was to show a finger four formation of Typhoons overflying the HAS site, with the leader breaking hard starboard (obviously the Commanding Officer's aircraft). I made a very rudimentary sketch to check I understood, which checked out. There remained the question of photographing Leuchers at the correct angle. I had stressed my need for a good photograph to work from, reinforcing this with my maxim of “the better the reference, the better the finished painting”. Also resident at RAF Leuchers at that time was the University Air Squadron, and it so happened one of their flying instructors, Flt Lt Roy Macintyre was a keen photographer, and the OC and Sqn Ldr De Vry were sure he would help us out. 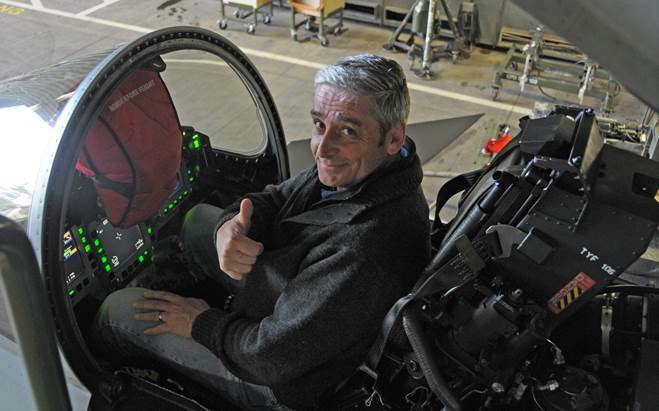 After thanking the Co, I was very kindly allowed to sit in the cockpit of a powered up Typhoon in one of the old “cold War” hardened aircraft shelters. A first for me, so a big thank you to the squadron for their kindness and trouble. Back in my studio, I turned my mind to composing the new layout. Although not yet in hand, I knew I would have good reference of the squadron site and estuary behind. Coming to the aircraft, I did not have the nerve to ask the CO to set up a flight to photograph a four-ship formation, with a lead aircraft break, especially for little ol' me. Also I thought I knew what perspective the aircraft should follow, and communicating this to a third party to shoot would be difficult at best, and I certainly had no knowledge of directing a four aircraft, airborne photo shoot, as exciting as that may sound. No, that was not happening, so I decided I was going to reference this with a model. I knew there was a large scale, pretty accurate model that would do the job. Once again, I decided to put some effort into setting up photographing the model at the correct angles now, at the rough stage, so I was confident of being able to produce the painting proper at the artwork stage. When I received the photographs of the airfield, I produced the rough of the new idea. I drew it out in line only, as I wanted to check with the squadron the technical side of the aircraft and it's weapons, as well as the general layout. This was received well, and after sorting out the size, delivery date and other details, I was ready to press on with the painting. I believe the production of a 3ft x 2ft canvas like this, with such detail in the background is as much about stamina as about skill. The photographic reference of the Airfield supplied by Flt Lt Macintyre helped me enormously. It was not a straight copy for me, as the shots were taken in a spread across a couple of passes of the airfield. It was overcast on the day it was shot, but I wanted to put a bit of a cloud dapple over the background, so that was a challenge. The aircraft structure and lighting was sorted with the photographing of the model, out in the sun for the shadows, and carefully set up to fit together. Further clues of colouring and small details were taken from RAF operational shots and other reference sources. I got some more detailed info on the weapons fit so I could check my ref was correct, and the painting finally started to come together and look like I wanted it to, which is always a bit of a relief. Especially as I did not have a great deal of time to adjust and fiddle with stuff before the date the painting was wanted. When finally done, with the last small aircraft ID letters applied to the tailfins, the picture was signed off as approved by the squadron OC. 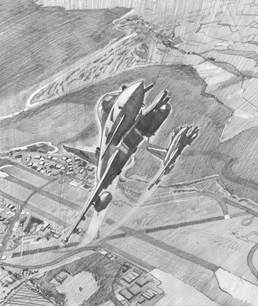 At the time the painting was completed, the squadron was on the move to their new base of RAF Lossiemouth. After varnishing and framing in an uncomfortably short time, it came to the day of delivery. I had a trip to Loch Ness planned earlier in the year to watch my wife run in the marathon there, and we managed to dovetail the two missions into the one trip. The squadron was really still settling into their new surroundings, but the OC, Wg Cdr Mark Flewin and Sqn Ldr De Vry were good enough to spare the time for a presentation out on the ramp, in front of a squadron Typhoon. Also with us was the incoming new OC, Wg Cdr Mike Sutton, who I was glad to hear, was also impressed with the finished painting. I am proud to have helped record the history of No1 (F) Squadron RAF, and their time at Leuchers. The officers I worked with, and helped by, were very generous with their time, and attention, making the whole process for me a pleasure and a privilege. I hope I get the opportunity to work with them again, or another RAF Squadron soon.